Artificial intelligence: what’s in it for retailers? Artificial intelligence (AI) is gradually seeping into everyday life. Machine learning and deep learning are behind AI. Smart software and flexible algorithms can help retailers improve not just customer service and customer engagement, but marketing, delivery times, fulfillment and analytic costs, too. Now, customers can place their order to a chatbot using a simple query. Before long, AI technology will be able to answer the questions the customer has not even asked. Who’s getting the job done? AI is at the basis of the next generation of chatbots and virtual assistants, who are sure to give actual advice and personal attention. Personal shopping assistants like Zalando’s Zalon or Sephora’s Kik can help onlife consumers in a super-personalized way. Thanks to AI, retailers and brands can give the best customer care to their customers, at each stage of the customer journey. A chatbot or virtual assistant can often get the job done, and, sometimes you need a real person. With AI learning from your behavior and translating that into personal attention, a new generation of smart devices in your home and digital assistants on your smartphone will soon be vital. Smart home speaker devices – Amazon Echo, Alibaba Genie, Apple HomePod and Google Home – are the next step for tech giants taking over yet another chunk of the customer journey. It exemplifies the revolutionary shift in consumer behavior from text to voice, for two simple reasons. Talking is easier than typing and it saves time – our most precious personal resource. The fast-growing number of smart home speaker devices will aim to win their spot in the kitchen or living room of your home. As households commit themselves to just one smart speaker, the real question is who will own your share of life: Amazon, Alibaba, Apple, Google or Samsung? Retailers and brands face the big question of how to stay connected to those customers planning to switch from text to voice and thereby transfer their share of life from computer or laptop to smart home speaking devices. AI intelligence in the background will need to turn algorithms into personalized learning skills that save us time in everyday life. Then, AI will prove worthy of the trust that consumers have given the brands and retailers with whom they share their life. In ‘The end of online shopping’ Wijnand Jongen describes the future of retail in a world that is always connected. 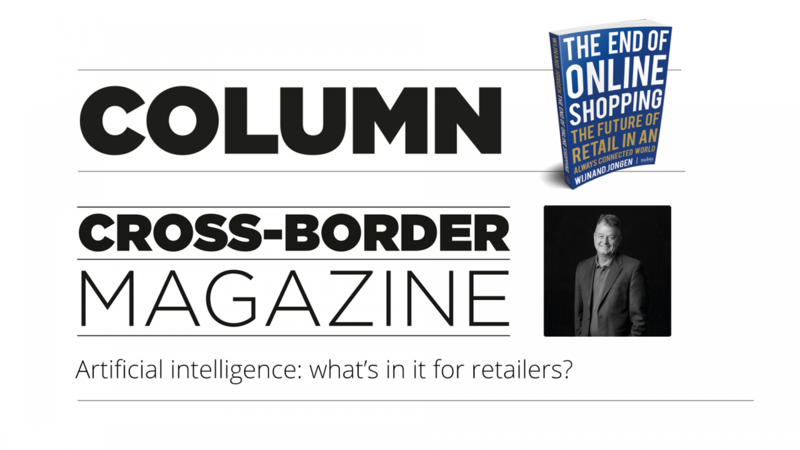 This is the fourth of a series of columns for Cross-Border Magazine in 2018, where Wijnand describes global retail trends. You can read the previous column here. Wijnand Jongen (1959) is one of world’s foremost authors, speakers and futurists on retail and e-commerce. His book was nominated best management (2016) and best marketing book (2017). He is founder and CEO of Thuiswinkel.org and Chairman of the Executive Committee of Ecommerce Europe.